As the year draws to a close, it’s time to start thinking about your resolutions for the year ahead – to get fitter, lose weight or tackle that marathon. But we also know that come January, it’s hard to stick to your resolutions. Here are 7 tips to keep it up in the new year. When you start running, having a goal is crucial. It gives you something to work towards and allows you to monitor your progress as you go along. A goal that inspires many runners is to sign up for a race. Depending on your fitness, you can start with a 5 km or 5 mile race. If you start training in January, you can be ready to run a race in March or April! Want to take on a challenge? Find a race near you. Beginners often ask how many times a week they should train. A good rule of thumb is to run at least twice a week – for instance, once during the week and once on the weekend. That leaves two days of rest between sessions so your body has enough time to recuperate. By contrast, running only once a week your progress will be slow and you’re more likely to give it up because ‘it doesn’t work’. Need some help setting a balanced training regime? Start a training plan. To stick to your training, you need to make running a part of your everyday routine, whether it’s early in the morning, in the evening or during your lunch break. Some people benefit from creating a strict routine, while other take advantage of the flexibility that running offers. In any case, you want it to become a habit. You brush your teeth, you do the dishes, you run. Running puts a big strain on your body, so it’s important to build it up slowly. Your general fitness will improve quickly when you start running, but your muscles and tendons will need time to get stronger. To avoid injuries, start by jogging at a calm pace and alternate this with walking. Then add distance, and don’t be tempted to speed up too much. Give your body time to adjust. If you get injured early on, chances are you’ll give it up altogether. Try to find an inspiring, natural environment to run in, whether a park, the woods or the dunes. Especially if you live in an urban environment, it’s much more relaxing to get away from the noise and fumes of traffic. If you need ideas, there are plenty of websites that showcase some of the best running routes and even allow you to share your own with the community. Having the right running gear not only reduces the chance of injuries, it also prevents you from using the weather as an excuse not to run. There are running clothing to keep you warm and dry in all types of weather, so a bit of rain shouldn’t deter you. Also, make sure to get the right shoes for your feet and your pronation pattern. Perhaps the best advice for sticking to your newly made running resolution is to buddy up. It’s more fun to run together and you can keep each other motivated. It’s safer too, especially when you’re running in the dark. That’s why many runners join a running club. Chances are you’ll meet other runners working on their New Year’s resolutions! 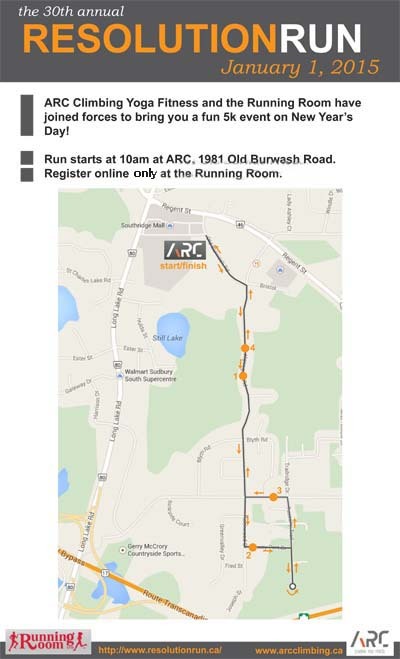 Half Marathon Run/Walk : Sunday February 22, 2015 @ 8:00 A.M. This years Hypothermic Half Marathon is capped at 80 participants, so be sure to sign up today to reserve your spot! Join us every Wednesday night at 6pm and Sunday morning at 8:30am for FREE run club!